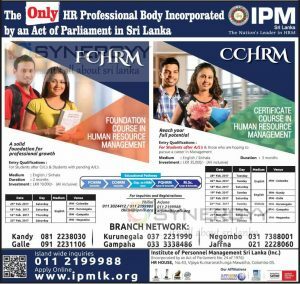 Institute of Personal Management of Sri Lanka invites applications for Foundation Course in Human Resource Management and Certificate Course In Human Resource Management for Feb 2017 Intakes. This is the first level of HR Professional qualification in IPM. Entry Qualifications: For Students after O/L’s & Students with pending A/L’s.